A little table right next to the fireplace seems like the perfect spot for our Valentine reservation with the coziness of a fire, the glimmer of twinkle lights and the romance of candles. Nestled next to the fireplace, I wanted our Valentine table to blend in and be a part of the little nook and romantic backdrop I decorated and wrote about in my last post. (click here to see) I love the way the mantle decorations look like they’ve tumbled over onto the table! 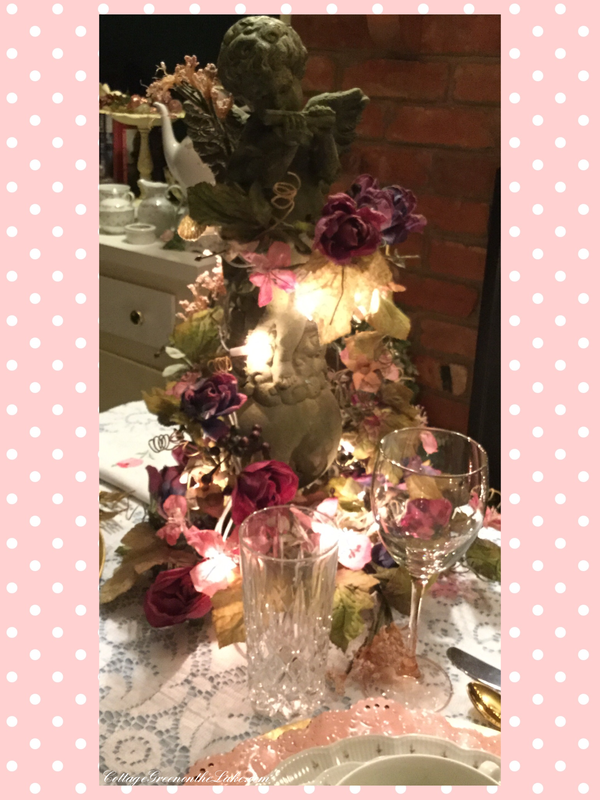 The whimsical piece that visually ties the mantle and table together is a cement statue of “Cupid.” The same roses, eucalyptus and twinkle lights I used on the mantle, wrap around the base of the angel, entwine the statuary and encircle his wings. For our dinnerware, I chose Kaiser Porcelain in the Marseille pattern that we bought when we lived in Germany; it’s a fine porcelain china and the white background trimmed with pink floral garlands and rosebuds is named “Romantica” and seemed the perfect choice for a day all about hearts and flowers! I love these white scalloped plates with their painted garlands and rosebuds and the Valentine look of the pink, doily-like charger beneath each plate. White napkins with a bit of crocheted lace and a sweet pink flower and Kaiser Porcelain roses are scattered about the table and adorn each place setting. Crystal “King Edward” Waterford glasses and pink blush stemware. The King Midas touch … gold chargers and goldware add “gleam” to each place setting. The drape of roses, eucalyptus, grape clusters and twinkle lights adorning the mantle and Cupid, adds subtle lighting and enchantment to the table. I’m delighted you read my Blog today! Please click on FOLLOW in my post above or FOLLOW on my site: cottagegreenonthelake.com to have all Cottage Green on the Lake news delivered directly to your email address. If you have any questions or comments, please leave those in the COMMENT section! 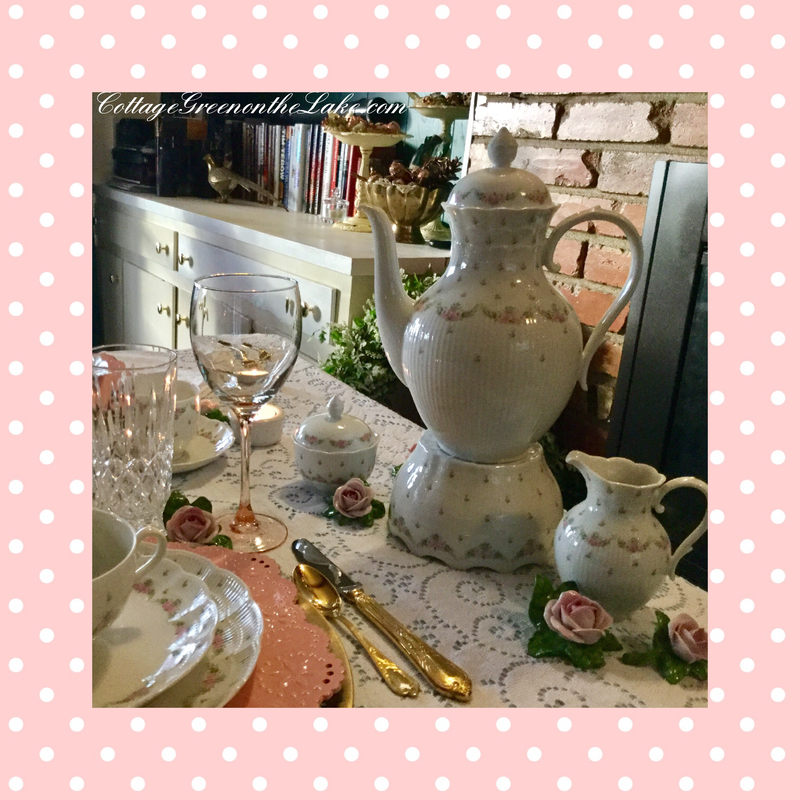 For some other great ideas, please join me (click here) for “Share Your Style Link Party #104 with host Lisa from Feathering My Empty Nest.